If you don’t already follow NextDraft, then this is your lucky day. NextDraft is a newsletter — or a column really — from Dave Pell that contains “the day’s most fascinating news.” And it is great. NextDraft is the only thing in the non-WordPress world that I make sure I read every day. From politics, to technology, to human interest and some really in-depth long reads — Dave Pell collects the best stuff on the internet and puts it in NextDraft. He also applies his own personality to each item which adds insight and enjoyment to the reader experience. Dave has some big names that vouch for the quality of NextDraft: Om Malik, Matt Mullenweg, and John Gruber are a just few from the tech side; people from virtually every major news outlet (NY Times, Buzzfeed, McClatchy) subscribe to and praise it. Hell, even Rainn Wilson from The Office loves it. And now NextDraft is centrally located on WordPress and WordPress.com VIP. 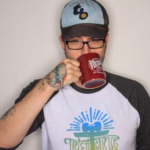 edit 9/9/13: Dave has since offered us the full story of the partnership with WordPress.com. It’s definitely worth reading as well. Andrew Norcross worked with Dave Pell to build a website to serve as a hub for NextDraft and the various channels the newsletter is published to: currently MailChimp and iOS. I had an opportunity to ask Dave some questions. And I also did a follow-up interview with Andrew to learn more about the inner-workings of NextDraft’s new home. 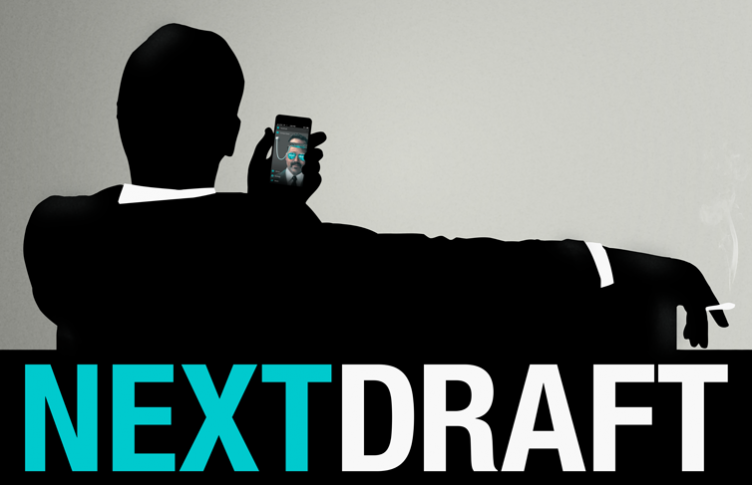 The newsletter and app seem to be huge hits, why do you want NextDraft to be a blog too? I wanted to have a blog version for a few of key reasons. First, I wanted to make the content more widely available to those folks who have an aversion to email and don’t use iPhones or iPads. Second, the blog version of NextDraft enabled me to dramatically improve sharing across all platforms. Thanks to some great work by Andrew Norcross, each of the ten news items I cover in NextDraft has its own permalink, so they are much easier to share. Third, I wanted a publishing dashboard that enabled me to push my content to the web, iOS devices, and Mailchimp (for the newsletter) with one click of the button. And that’s exactly the system I have now. Do you have plans to monetize NextDraft on the web? If so, how? 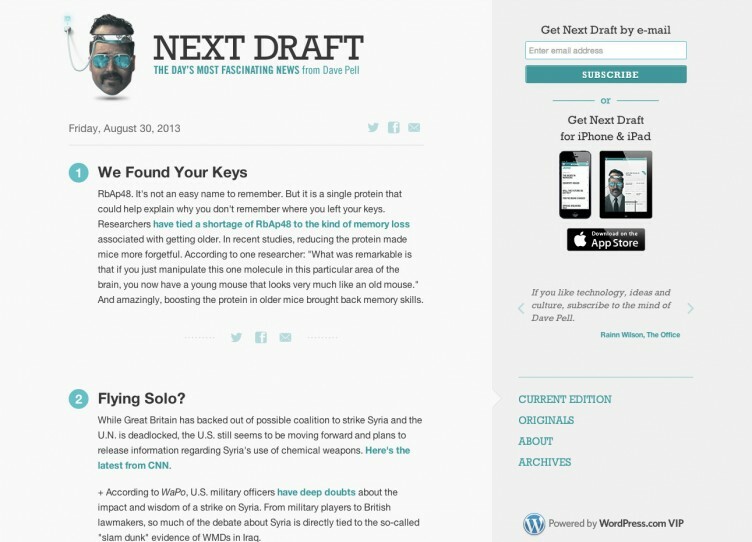 As of this week, NextDraft is being completely underwritten by WordPress.com. I have always been an independent publisher and I am a longtime user of WordPress products and services. So I couldn’t ask for a better sponsor. And my readers will continue to get free content without a lot of intrusive ads. What’s your process for distributing NextDraft to email, the app, and now WordPress? I do it all from one highly customized WordPress installation developed in partnership with Andrew Norcross of Reaktiv Studios. When I press publish, my content is parsed for the web, for my iOS apps, and sent to email subscribers via the MailChimp API. Do you think open-source platforms like WordPress are important in today’s news landscape? The web is all about empowering people to express their creativity. Thanks to companies like WordPress, an independent publisher like me can have access the same powerful tools used by major publishers. That helps me to express myself, and it levels the playing field a bit. Assuming you track analytics periodically, are you ever surprised by what readers tend to click on? Or are we terribly predictable? In general, you’re pretty predictable. I usually include links to funny or weird stories as my tenth item (I call it the bottom of the news). These tend to be popular clicks. But I have been surprised — on NextDraft and across the web — by how interested people are in quality long reads. Those are always quite popular. The short blasts of content we find on Twitter and Facebook have not destroyed our attention spans. It’s made people more hungry for longform content. You’ve said before that, “web 3.0 will be the era when humans strike back” and filter the web for each other. What do you think it’s going to take to do that profitably? I don’t think it will always equal profitability, nor do i think that’s the core goal of all sharing. But I do think that humans can curate content a lot better than machines. And in cases where those humans develop a decent-sized following, they can monetize. Are you looking forward to being able to fix typos? On the blog yes. On the iOS app, yes. On the newsletter, once it’s gone, it’s gone. But I do look forward to the day that everyone who sees a typo will not feel compelled to email me and let me know about it. Thanks Dave! By the way, I still haven’t tried the peanut butter and pickle sandwich you so highly recommend. It’s a tragedy. That advice was my single most important contribution to the Internet. The rest is filler. Of course I was interested how Andrew built this thing. If you’re not a regular reader, note that each day Dave has ten topics he writes about for the newsletter. Dave’s process for publishing NextDraft already existed before the website. The mailing list existed. The iOS app existed. So, we had to take the existing process and build WordPress around it. Previously, the content was built around Dave’s raw HTML file he’s been using for a long time, and the iOS app received data from a JSON file generated from MailChimp’s RSS feeds. Now, Andrew has built a custom parser on the backend of WordPress that Dave pastes his template markup into, and the backend parses it with PHP DOMDocument to extract the content for the day as well as divide each of the ten items for the day. At this point, Dave can use a one-click button to send the data in the appropriate format to MailChimp, as well as send himself a test email. The entire feed is a custom post type where the parents are the day and each item, or blurb, is a child of that day. The JSON feed is dynamic so that when you go to the appropriate link it generates the most up-to-date content from the WordPress database. These JSON feeds are utilized for the app content, which busts its cache and updates the newsletter in the app if the JSON feeds change. Hence, Dave can now easily fix any typos in WordPress that are automatically fixed on the website and in the app. Only the email keeps the typo. Dave has been on the internet for a long time. He’s run Tweetage Wasteland for a number of years, and now it redirects to NextDraft Originals, which Andrew is using as the default Post post type. Everything about the website is WordPress and uses WordPress functions, other than the PHP DOMDocument parts, but very little of the display portions of the website function like default WordPress. I also had to ask how Andrew got together with Dave for this project. There’s an artist called Sam Spratt that Andrew followed, who tweeted in March 2012 asking if anyone was looking for a web job. As a fan and follower of Spratt’s work, Andrew responded; and it turns out the job was for the prior landing page build for NextDraft. It was a relatively small job. But early this year, Dave got in touch with Andrew again to talk about moving NextDraft into WordPress. They brainstormed how to get Dave’s newsletter template into WordPress and they worked up what exists today, which offers the ability to manage the data and send it to a variety of platforms. Above and beyond everything else, this truly shows some of the many things WordPress can do. … The site itself now acts as the hub, and other channels of Dave’s content act as an extension of his own product that he owns. If he wants to build an Android app, no problem. He can integrate into all sorts of things. He’s essentially built a NextDraft platform. As a final personal note, my goal for the Post Status “Links” section was heavily motivated by Dave Pell’s method for delivering curated news with his voice attached to it. Aside from his newsletter being excellent and the site build being interesting, that’s probably part of why I’m so excited to profile NextDraft here. Thanks to Dave for answering my questions. And thanks to Andrew for hooking me up for the interview, and giving me some insight toward how NextDraft was built and how it works. Not gonna lie, this was one of the coolest things I’ve ever built, mainly because of how it works behind the scenes. I mean, yeah, it looks good on the front, but the WP powered engine behind it is pretty awesome. At least to nerds like me. Jason Kottke introduced me to so many great things in my life today. Blogging, WordPress, David Sedaris, and The Next Draft. I am so glad to see Next Draft on WordPress. It looks great, but I think I will still read it in my inbox. Dave is right about long reads, they are my favorite too.